Pre-use inspections will show on screen for download and we will email you a copy. A programme of daily visual and functional checks, regular inspections and servicing schedules should be established in accordance with the manufacturer’s instructions and the risks associated with each MEWP. 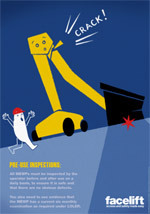 Operators should be encouraged to report defects or problems. Reported problems should be put right quickly and the MEWP taken out of service if the item is safety critical. The MEWP must be thoroughly examined at least every six months by a competent person or in accordance with an examination scheme drawn up by such a competent person.